For For a general synopsis on the general development of cavalry and uniforms in the late nineteenth century, please read the introduction to Dragoon Guards and Dragoons here. Lancer regiments had been a feature of European armies since the middle of the eighteenth century, or even earlier. The emergence of the Polish lancer in the Galician province of Austria soon grew to earn these troops a reputation as fearsome cavalry. By the Napoleonic Wars, lancers dressed in the Polish style with the four pointed Tschapka headdress were being used as decisive troops in combat with infantry squares. Like the Hussars, the British came late to adopting Lancer regiments. The terrifying encounters that the British infantry experienced against these troops in the Peninsular War may have convinced the powers-that-be that similar regiments needed to be raised in the British Army. The first regiments raised from September 1816 were the 9th, 12th, 16th, 19th and 23rd all converted from Light Dragoons. The 23rd were quickly disbanded in 1817 and the 19th in 1821. The 17th Light Dragoons were redesignated Lancers in 1822. These regiments all adopted extravagant uniforms with tall tschapkas, tightly fitting coatees with coloured plastrons and baggy “Persian” trousers. The Uniforms were blue with red or crimson facings (Later white for the 17th). When William IV came to the throne in 1830 he ordered all regiments in the British Army to wear scarlet coatees or jackets. The order was resisted of course by the Royal Horse Guards but also by hussars and rifles. 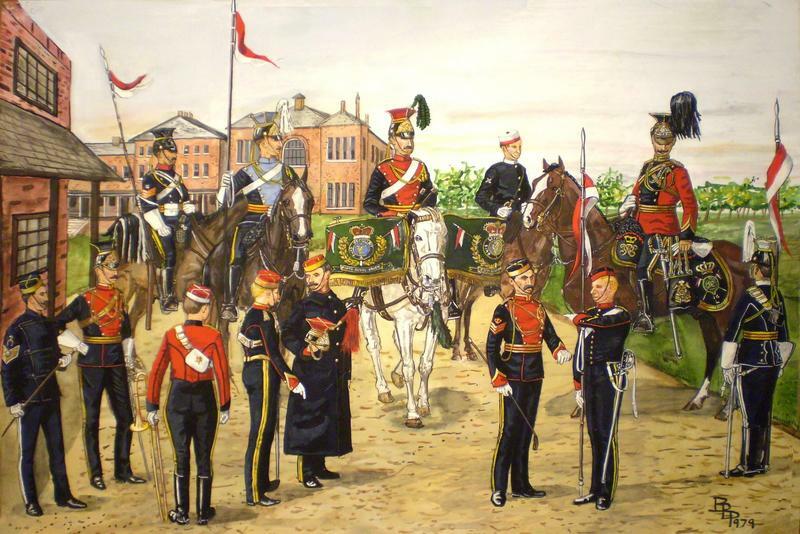 Lancers did adopt scarlet but with the accession of Queen Victoria they reverted to blue again, except for the 16th Regiment who would retain scarlet indefinitely. The 5th (Royal Irish) Dragoons, a regiment raised in 1689, was disbanded for mutiny at Chatham in 1799. In 1858, it was re-raised as the 5th (Royal Irish) Lancers in line with a general expansion of the British cavalry at the time. By this time, the Lancer uniform had evolved along European lines with a double breasted tunic with lapels and piping in regimental colours. The front of the lapels were turned back to form a “butterfly” above the 2nd button. The size of the cap by now had been reduced, first in 1837 and again in 1856. Trousers were the same as for all cavalry, being booted overalls. In 1871 tunic skirts were shortened and the overalls were exchanged for knee boots and pantaloons. In 1873, lancer tunics were changed to reveal a full plastron in facing colour. There were very few changes made before the end of the century. In 1897, the 21st Hussars were ordered to convert to lancers and became the 21st (Empress of India’s) Lancers later in the century.